1.1 This document sets out the general terms and conditions ("Terms") of our business relationship with you. In particular, these Terms will apply to your use of the Service, Website, Application and all transactions you make through our Website and our Application. In these Terms, "we", "us" and "our" refer to The X Collective Pte Ltd. whilst "you", "your", "User" or the "Purchaser" refers to you. 1.3 Your use of the Application, Website and/or Service is subject to these Terms and such other additional terms and conditions as we may impose from time to time. You will be informed of such additional terms and conditions accordingly. 1.4 If you do not agree to these Terms and/or other relevant terms and conditions which have been made known to you, you should immediately stop (i) accessing the Website, (ii) using the Application, (iii) using the Service. 1.5 You acknowledge that there are inherent risks in conducting transactions over the internet or electronic networks and you have voluntarily assumed those risks. 2.1.1 "Application" refers to the WINK+ mobile software application which may be downloaded by you from platforms (such as the Apple App Store and Google Play) as we may determine from time to time. 2.1.2 "Service" means all or any of the services provided by us to you including but not limited to the information services, content and transaction capabilities on the Website and Application. 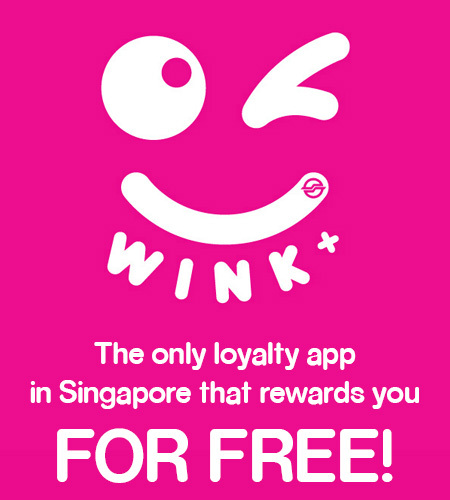 2.1.3 "Website" means the WINK+ website at: https://www.winkwink.sg. 3.1 These Terms are subject to change from time to time and any changes will be uploaded on the Website. These changes shall take effect from the date of upload and continued use of the Service, Application and/or Website from such date will be deemed to constitute acceptance of the new Terms. It is your responsibility to check the Website for such changes from time to time. 4.1 You must be 18 years or over and able to enter into legally binding contracts to use the Website, Application and/or the Service. You represent and warrant that you are at least 18 years old as at the date of submitting your registration form to us (see Clause 5 below).If you are under 18 years old, your parent or legal guardian must agree and accept these Terms for and on your behalf and your use of the Website, Application and/or the Service shall be with the authorization from your parent or legal guardian. 4.2 The Website, Application and Service cater predominantly to those who access the Website or Application from Singapore. If you choose to access the Website or Application (or use the Service or make a purchase) from locations outside Singapore, you do so of your own accord. Regardless of the location from which such access is made, you are solely responsible for the consequences and for compliance with all applicable laws. 4.3 You should make your own evaluation of the accuracy or completeness of any information, promotion or content available through the Website and/or Application. 4.5 We reserve the right to change, modify, substitute, suspend, withdraw or remove without notice any information or the Service from time to time. Your access to the Website, Application and/or the Service may also be occasionally restricted to allow for repairs, maintenance or the introduction of new facilities or services. We will attempt to restore such access as soon as we reasonably can. We assume no responsibility for functionality which is dependent on your browser or other third party software to operate (including, without limitation, RSS feeds). 5.1 All accounts must be registered with a valid personal email address. We may require you to re-validate your account if we believe it has been registered using an invalid email address. We reserve the right to decline a registration. 5.3 Upon successful registration, an account would be created for you and we will provide you with a password with which to operate your account. You are responsible for all use of the Service and all transactions entered into by means of the Service, Website or Application under your account. You shall not divulge your account details, including your password, to anyone. You remain responsible for all transactions which may occur as a result of a disclosure by you of your password to third parties or through any unauthorized access to your personal data / information by third parties. If your password has been compromised, you should immediately notify us and change your password. We will never ask you for your password. 5.4 You can see, review and change most of your personal data / information by signing on to the Website. You must promptly update your personal data / information if there are changes or if you realize that it is inaccurate. Once you make a public posting, you may not be able to change or remove it. Upon your request, we will close your account and remove your personal data / information from view as soon as reasonably possible. We do retain personal data / information from closed accounts for, among other reasons, to comply with the law, prevent fraud, collect any fees owed, resolve disputes, troubleshoot problems, assist with any investigations, enforce the Terms, and/or take other actions permitted by law. 5.5 If you access our Website from a shared computer you understand and accept the risks of doing so. 5.6 We reserve the right to close your account if you use proxy IPs (Internet Protocol addresses) to attempt to hide the use of multiple registration accounts, or if you being a non-Singapore user pretends to be a Singapore user, or if you disrupt the Website or the Service in any way. If you use multiple logins for the purpose of disrupting a community or annoying other users you may have action taken against all of your accounts. 6.1 You acknowledge that all points, benefits and/or rewards earned and/or redeemed by you (if any) through the Application, Website and/or Services shall remain our property at all times and we shall not be held liable for any compensation and/or refund to you arising from such points, benefits and/or rewards. 6.2 You warrant that all information you provide in connection with the Website, Application and Service are, complete and accurate and that you will promptly inform us of any changes to such information. 6.3.4 to send or receive any material which is technically harmful (including computer viruses, logic bombs, Trojan horses, worms, harmful components, corrupted data or other malicious software or harmful data) whether to your computer or ours. 6.4.5 executing any form of network monitoring which will intercept data not intended for you. 7.1 We may terminate these Terms at any time. In particular, we may immediately terminate your use of the Website, Application and/or Service in the event we consider, in our sole discretion, any of your conduct to be unacceptable, or in the event you breach these Terms. This would include but not be limited to closing your account with us and removing you from our database of registered users. 7.2 Our right to terminate these Terms shall not prejudice any other right or remedy we may have in respect of any breach or any rights, obligations or liabilities accrued prior to termination. 7.3 Without prejudice to the above, we may, in certain circumstances, choose to suspend your use of the Website, Application and/or Service if you use, or a person authorized by you uses, the Website, Application and/or Service in breach of these Terms. We may restore your right to use the Website, Application and/or Service at our discretion. 7.4 The provisions herein that are either expressed to survive the expiry or termination of these Terms; or from their nature or context it is contemplated that they are to survive such termination, shall survive termination of these Terms. 8.1 You shall indemnify us, our related corporations and their respective directors, officers, employees and agents from and against all actions, claims, suits, demands, liabilities, costs or expenses arising out of and in connection with the use of the Website, Application and/or Service, including any breach of these Terms by you or any other person using your identification details, account or password. 9.1 We warrant that we will exercise reasonable care and skill in performing our obligations under these Terms. 9.2.3 the Service, Application or the Website is free from viruses or anything else which may have a harmful effect on any technology. 9.3.5 any consequential or indirect losses including but not limited to damage to or corruption of data, loss of opportunity, goodwill, reputation or anticipated savings. 9.4 In no event shall we or any of our related persons or related corporations be liable for any incidental, special, punitive, or consequential damages of any kind (including, without limitation, potential loss, loss of income, loss of profits or other pecuniary loss). 9.5 Our total liability to you or any third party under any theory of law shall in no circumstances exceed, in aggregate, a sum equal to S$50 in relation to any claim in connection with your use of the purchase of the Services, Website and/or Application. 10.1 Our Website and Application may contain links to third party sites, including but not limited to social networking sites such as Facebook or Instagram, advertisements and resources (collectively "Third Party Websites"). You acknowledge that we do not operate or control such Third Party Websites. We will not be responsible for (i) such Third Party Websites including but not limited to their content or products or services, and (ii) any loss or damage that you may incur from arising from your access, purchase and/or use of such Third Party Websites and their content, products or services. If you decide to access any of the Third Party Websites linked to the Website or Application, you do so entirely at your own risk. 11.1 All intellectual property rights (including all copyright, patents, trade marks, service marks, trade names, and information content on the Website, Application or accessed as part of the Service, any database operated by us and all the website design, text and graphics, software, photos, video, music, sound, and their selection and arrangement, and all software compilations, underlying source code and software (including applets and scripts) are owned by and shall remain our property or that of our licensors. You shall not, and shall not attempt to, obtain any title to any such intellectual property rights. You may not otherwise reproduce, modify, copy or distribute, exploit, sub-license or use for commercial purposes any of the materials or content listed above without our permission. 11.2 Any material you transmit or post or submit to the Website (or otherwise to us) shall be considered (and we may treat it as) non-confidential and non-proprietary, subject to our obligations under the Singapore Personal Data Protection Act (No. 26 of 2012). You grant us a royalty-free, perpetual, irrevocable, non-exclusive right to use, copy, modify, adapt, translate, publish and distribute world-wide any such material. 12.2 In the event of any dispute or difference arising out of or in connection with or in relation to these Terms, including any question regarding the existence, validity, application or interpretation of these Terms or any of its provisions, both parties shall endeavour to settle the dispute informally by agreement between the parties. Both parties shall always act in good faith and co-operate with each other to resolve any disputes. 12.3 Notwithstanding anything in these Terms, if the dispute is not settled in accordance with the clause above, the parties shall endeavour to resolve the same through mediation in accordance with the mediation rules of the Singapore Mediation Centre. A party who receives a notice for mediation from the other party shall consent and participate in the mediation process in accordance with this clause. Failure to comply with this clause shall be deemed to be a breach of these Terms. 12.4 If the parties are unable to resolve the dispute after mediation, then subject to the right of either party to apply to the Singapore courts for equitable relief available to preserve the status quo or to prevent irreparable harm, the dispute shall be referred to and finally resolved by arbitration in Singapore in the English language, conducted in private in accordance with the Arbitration Rules of the Singapore International Arbitration Centre for the time being in force which rules are deemed to be incorporated by reference to this clause. The arbitration shall be conducted before 1 arbitrator. Each party shall bear its own costs in connection with the arbitration proceedings. 13.1 We shall not be liable for any loss, damage or penalty resulting from delays or failures in performance of our obligations under these Terms if the delay or failure results from events beyond our control. 14.1 Nothing in these Terms shall be construed to create a joint venture, partnership or agency relationship between you and us. You do not have any authority to make any contract, whether expressly or by implication, in our name. 15.1 You may not assign or delegate or otherwise deal with all or any of your rights or obligations under these Terms. We shall have the right to assign or otherwise delegate all or any of our rights or obligations under these Terms to any person without having to seek your permission. 16.2 If any provision herein is held by the Singapore Court to be illegal or unenforceable, the same shall be deemed to be deleted from these Terms and shall be of no force and effect; whereas the remainder shall continue in full force and effect. No waiver by us of any of these Terms or default of yours under these Terms shall operate or be construed as a waiver by us of any future defaults or provision. 17.1 Except as otherwise provided in these Terms, notices which are required to be given in or under these Terms shall be in writing (unless expressly stated otherwise) and shall be delivered by hand, electronic mail, fax or by pre-paid post, to you at the address you supplied to us or to us at our registered office. 18.1 These Terms apply equally to and are for our benefit and our third party content providers and licensors and each shall have the right to assert and enforce such provisions. Subject to the previous sentence, no provision herein is otherwise enforceable pursuant to the Contracts (Rights of Third Parties) Act (Cap 53B) by any person who is not a party to these Terms. 19.1 These Terms shall be governed by and construed in accordance with Singapore law. Both parties hereby submit to the exclusive jurisdiction of the courts of Singapore.